Green tomatoes are one of the South's best-kept vegetable secrets! Until the early 90s, most of America had no idea that fried green tomatoes were a "thing." And then Fannie Flagg came along with the book "Fried Green Tomatoes at the Whistle Stop Cafe," which was subsequently made into a hit movie. These recipes include a few versions of Southern fried green tomatoes along with some fabulous fritters, green tomato rice, soup, relishes, and a moist and delicious cake. It's surprising how something as unexpected as unripened green tomatoes can brighten up a dish. 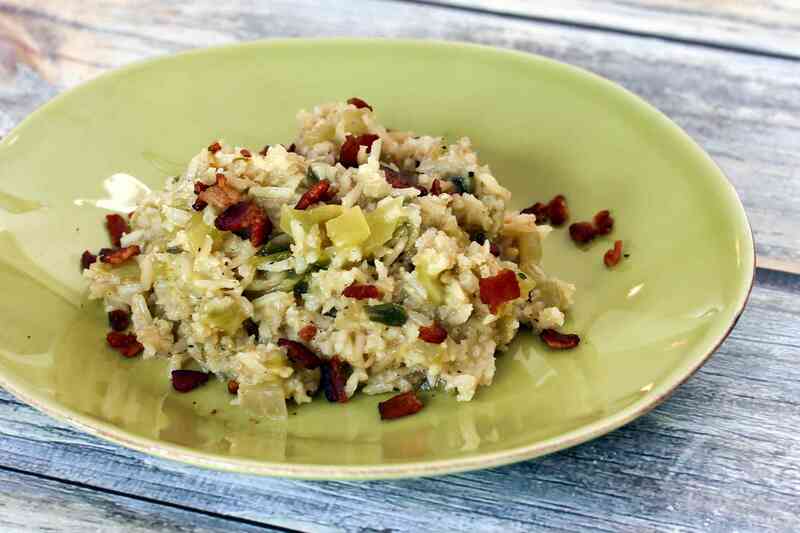 This green tomato rice is bursting with flavor and color, and it's another excellent way to use end-of-season tomatoes before the last frost. Green tomatoes gained national fame in the early 90s with the movie, "Green Tomatoes at the Whistle Stop Cafe," based on the book by Fannie Flagg. Before that, most Americans were unaware of the great taste of those late season tomatoes. This easy fried green tomatoes version includes an egg and a seasoned cornmeal and flour batter. These sweet, cake-like fritters are fluffy deep-fried treats! The sweet corn and green tomato fritters are similar to doughnuts and are fantastic with maple syrup or golden cane syrup. Or dust them with some powdered sugar. They make a delicious breakfast, brunch, or dessert dish. 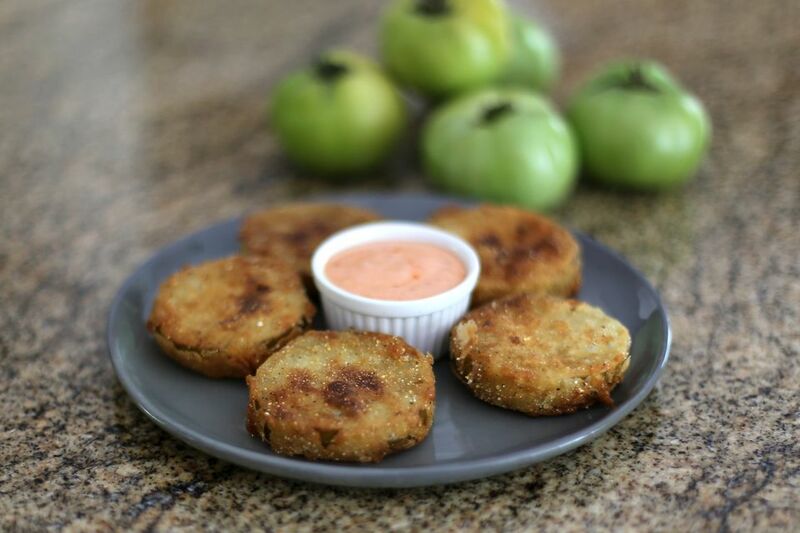 The Sriracha mayonnaise flavors these classic fried green tomatoes perfectly. A fried green tomato sandwich? Yes, please! This bacon, lettuce and fried green tomato sandwich is a grilled BLT with the addition of fried green tomatoes. Remoulade sauce is the perfect spread. This hearty green tomato soup gets flavor from smoky, salty diced country ham. It's fantastic with hot baked cornbread or biscuits. This green tomato ketchup is a tangy, delicious surprise. Honey, vinegar, and a variety of spices flavor the green tomato puree. This homemade green tomato hot dog relish is fantastic on hot dogs, sausages, and hamburgers, or stir some into pasta or potato salad or deviled egg filling. It's great stirred into chicken or tuna salad as well. If you're like many Southerners, you like to surprise friends and family with unique desserts. This green tomato cake fits the bill; it will surprise and delight! Frost it if you want, or dust it with some sifted powdered sugar. These delicious sweet and tangy green tomato pickles are similar to bread and butter pickles, but with green tomatoes instead of cucumbers. The well-balanced sugar and vinegar mixture is perfectly spiced. A simple cornmeal coating is all you need to make these classic fried green tomatoes. This delicious relish combination uses two of the garden's most prolific vegetables: green tomatoes and zucchini. This ketchup is an excellent condiment to serve alongside your beans or greens, or enjoy it as a topping on hot dogs and burgers. Use a grinder to make this zucchini and green tomato relish or chop the ingredients finely. Move over, apple pie! Here's a spiced green tomato pie your family will love just as much. Slather this moist, delicious green tomato quick bread with butter or a flavored cream cheese spread. Serve it as a breakfast bread or snack. This green tomato and cabbage relish also has bell peppers, and onions. It's especially good with pinto beans or black-eyed peas.